The number of pages on the Android Home screen isn’t fixed. You can add pages. You can remove pages. You can even rearrange pages. These features might not be available to all Android phones and, sadly, they’re not implemented in exactly the same way. The stock Android method of adding a Home screen page is to drag an icon left or right, just as if you were positioning that icon on another Home screen page. When a page to the left or right doesn’t exist, the phone automatically adds a new, blank page. Other phones may be more specific in how pages are added. For example, you might be able to choose a Page command from the Home screen menu. 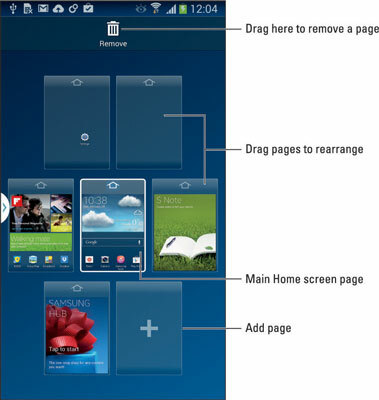 Samsung phones feature a Home screen page overview. 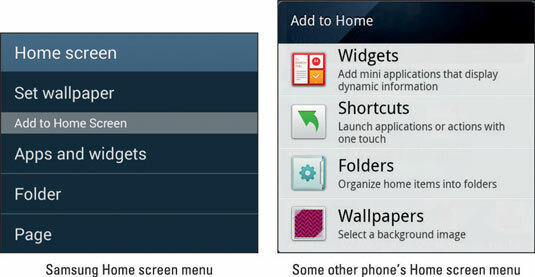 To edit Home screen pages, touch the Menu icon while viewing the Home screen and then choose the Edit Page command. You can then manage Home screen pages as illustrated in the figure. Generally speaking, to rearrange the pages, long-press a page and drag it to a new spot. When you’re done, touch the Back or Home icon. The total number of Home screen pages is fixed. The maximum may be three, five, seven, or nine, depending on your phone. A minimum number of Home screen pages also exists.